Looking for furniture in a retail store can be overwhelming and exhausting, especially if the store is unorganized or too full of furniture. Thank goodness for stores like Room & Board that not only are well designed, but also full of design consultants and resources to make the shopping experience easy and, believe it or not, fun! Room & Board is where Alex fell in love with the next cool find for the loft: the dining room chairs. After doing some initial research online, he headed to the Atlanta store in search of the Lira dining room chair manufactured by Lee Industries. The Lira chairs can best be described as sleek and modern, perfect for Alex’s design aesthetic. They work well in the loft because they have an architectural element that relates to the space; a vintage feel but in a completely brand-new chair. The chair seat floats in a stainless steel frame and the arms fit underneath the table, taking up minimal space. The frame gently flexes as you sit in the chair. The fabric selected, known as Sims Granite through Lee Industries and Room & Board and as Heritage Granite through Sunbrella.com, is a Sunbrella fabric made with 50 percent recycled content with a homespun, organic look to it. The classic, dark grey color fits the color palette Alex has set for the loft and adds to the cool, modern feeling of the chairs. 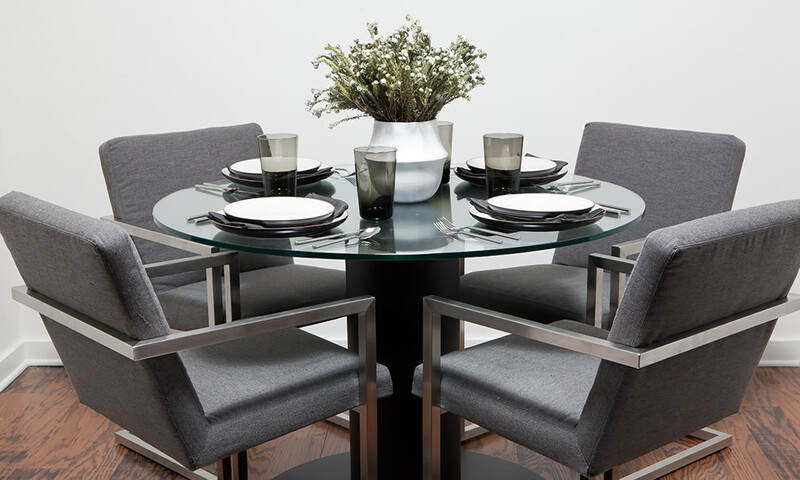 Room & Board Lira Dining Chair in Sunbrella Simms Granite fabric: Glamour meets function, the perfect combination for the urban loft Alex is bringing to life. Share your favorite piece of furniture with us. Tweet @Sunbrella #perspectiveATL.